Attention all home cooks: You can buy all the fancy gadgets your heart desires, from a gleaming chinois to the Ferrari of food processors. But, as any professional chef will tell you, all you really need are a few top-notch knives—and the skills to go with them. There are so many choices out there, so many nuances to knife purchasing and handling, that we would do well to learn all about knives from a pro. For instance, what’s the one type of knife you should have if you’re only going to have one? What are the best brands and where do you find them? Should knives really last a lifetime? How do you know when one is kaput? How do you sharpen and clean your expensive knives, and, perhaps most importantly, what do you need to know about knife safety? 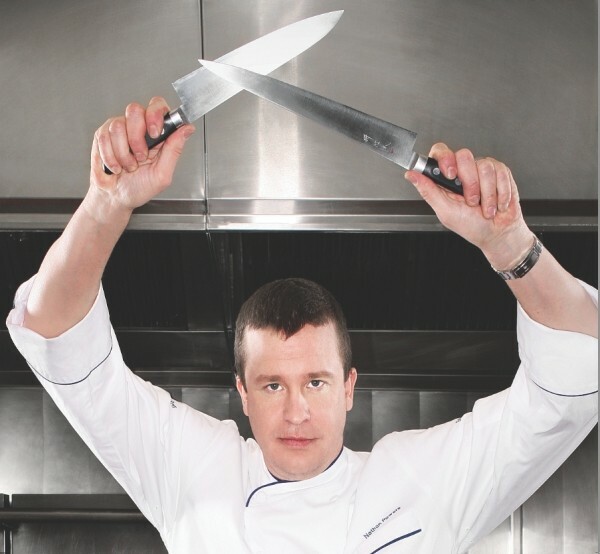 If such culinary quandaries pique your interest, you’ll be happy to know that Bambara Executive Chef Nathan Powers is planning to host Mastering the Cut, a knife-techniques demonstration and tempting lunch that will cover the basics, and then some. Powers, who has amassed a collection of 200 knives, will cover all of the above and more—including why and how to use a certain knife for a certain cut. His menu for the class highlights key knife skills—brunoise, chiffonade and more—and he’ll demonstrate proper technique on each course, including iced oysters with champagne-shallot mignonette; watermelon gazpacho with basil and mint; and butterflied leg of lamb with zucchini and goat-cheese risotto.